I have seeds to share! Calendula-all the ones in my yard grow yellow. Borage-These are blue and lighter blue to white depending on where in the yard they grow. 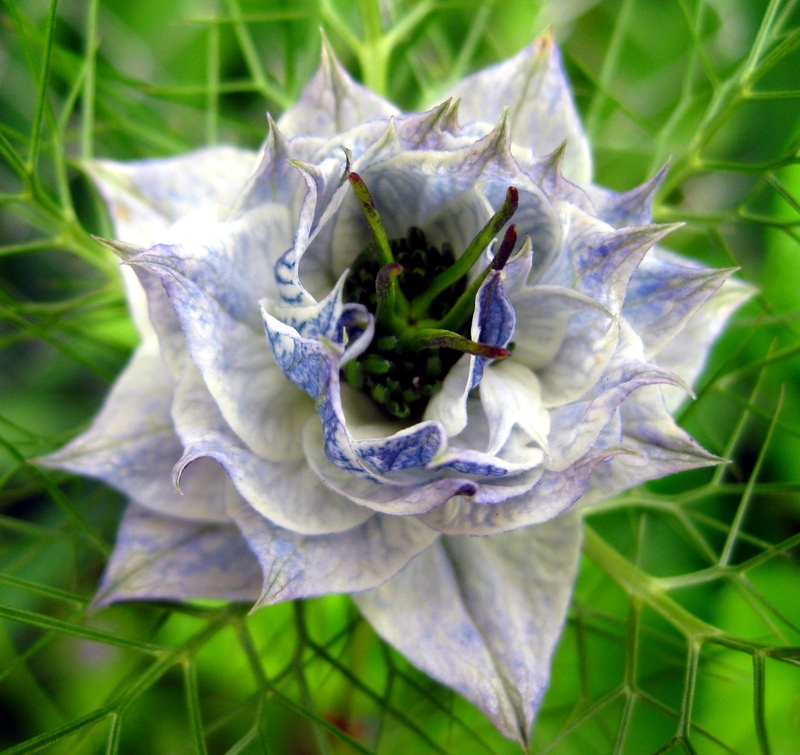 Love-in-a-mist- these range from blue to white. These things are fun! 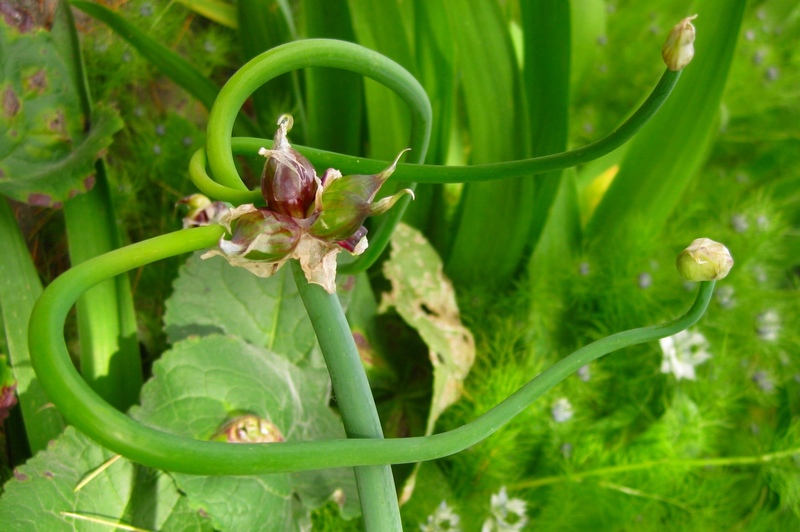 They can be used as scallions when they are young or like shallots when they are big. I only have a few sets of 3 so I can’t spread as much cheer with these as I would hope. My trillium had seeds this year! 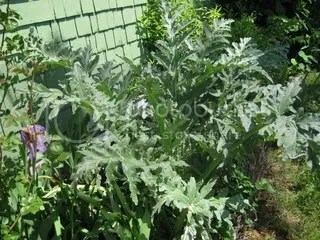 These are beatufil plants but can be hard to grown. Also, for a limited time I am offering my craft roasted coffee. Go here for delicious coffee. Stumptown Vegans podcast and how I grow hops! So, a few weeks ago I was a host on the Stumptown Vegans podcast .Well, the show is up in all its sugar crashy-ness. Go here if you want to listen. And for photos. 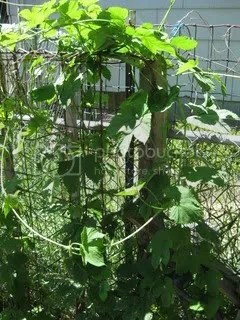 Here’s the trellis I made for my Cascade Hop plants. The twine is attached to an old box springs I use in my garden one one end and to the upstairs bathroom window. this should give them more lights, make a canope at the back door, and be super easy to harvest by just tossing down the twine! This was a few weeks ago. I'll post a new photo soon! 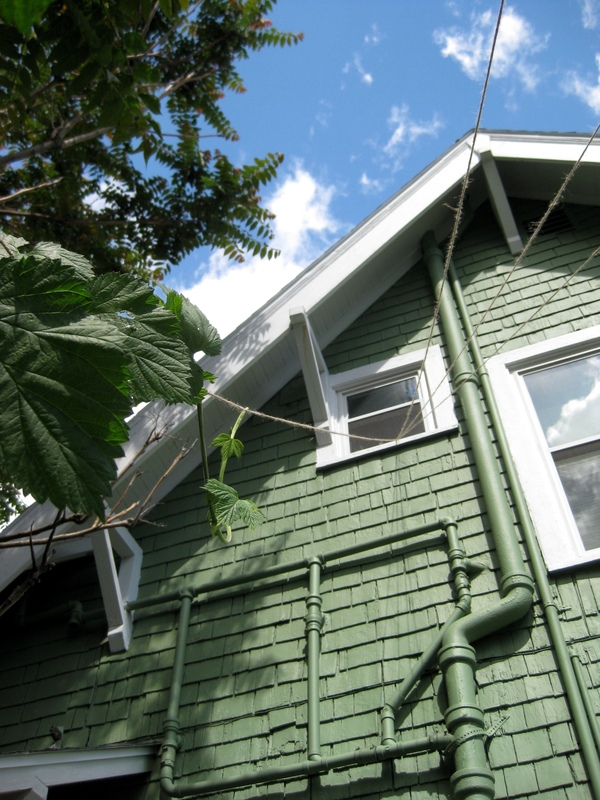 looking up the side of my house...noitce the plumbing on the outside of the house. Paul and I are headed up to the Riverhouse for some time together before I head up there for the weekend with whoever wants to come. Another busy week of visitors and button work. There was even a wedding mixed in there too! 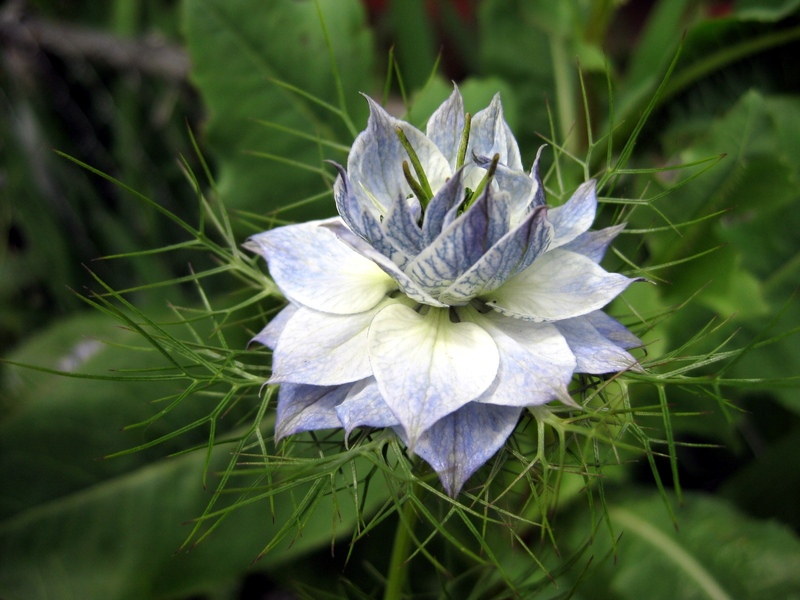 Besides all the irises that ring my yard there are two other plants that show up every year: Egyptian Walking Onions and Love-In-A-Mist. They have been here longer than I have and I am happy to see them ever year! Egyptian Walking Onions are awesome! 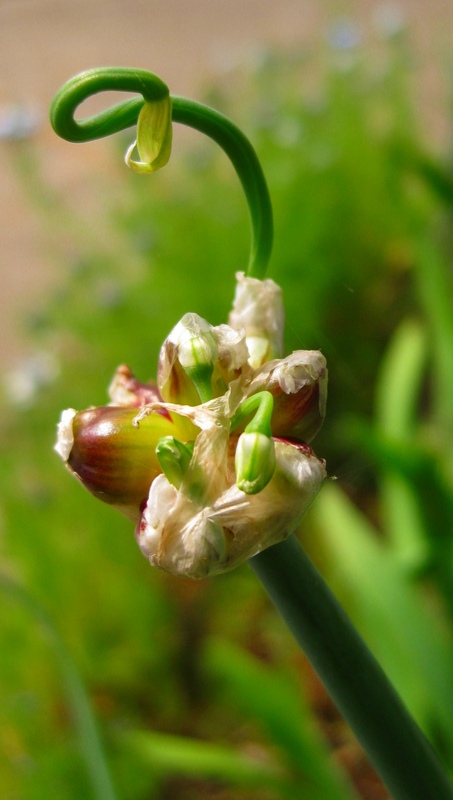 They can be eaten young like green onions or you can let them grow and eat them like shallots. If you let them grow they make their own little bulbs at the top and send out weird alien spindly shoots that form yet more bulbs! 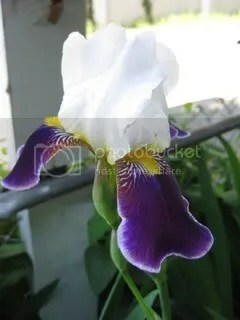 The bulbs and shoots eventually weigh down the plant or reach the ground and plant themselves, hence, “walking”. I like that they sort of meander around my yard from place to play. I also send off bulbs to people to start their own walking garden. Let me know if you would like some. these onions were made for walking...ok, that was dumb. I'm sorry. 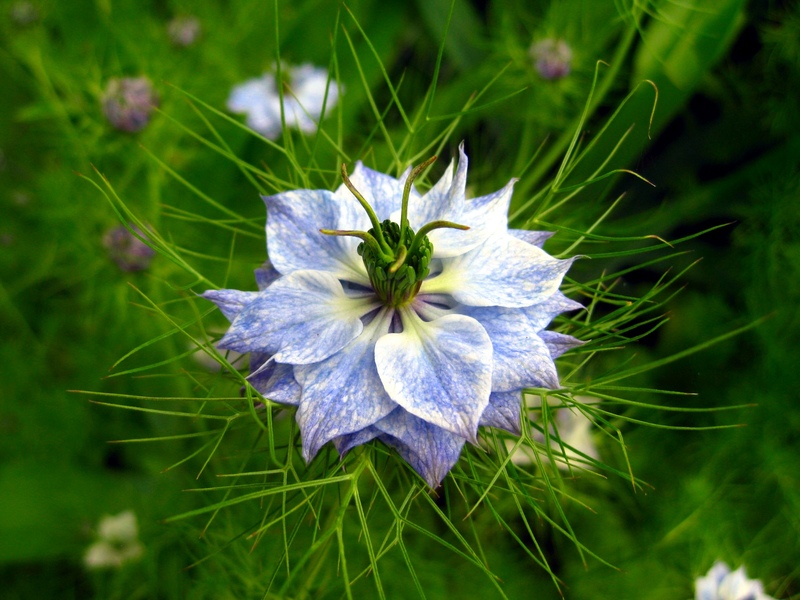 Love-In-A-Mist reminds me of two things; that the plant looks like it should grow underwater, and that my ex-boyfriend had them growing outside his cottage when I was 18. 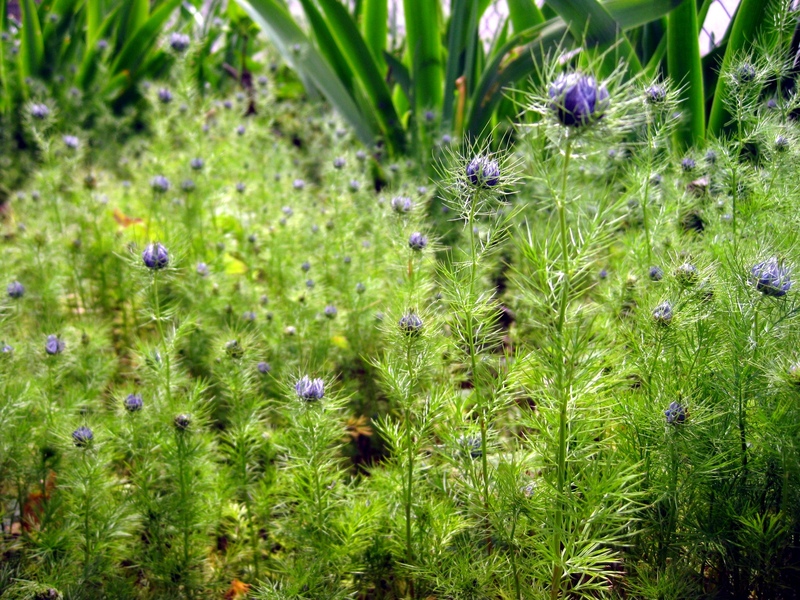 They are one of the first green things to start growing in my yard each year and shoot up fluffy, fuzzy stems that eventually form intricate blue star shaped flowers. They are just so dreamy to me! 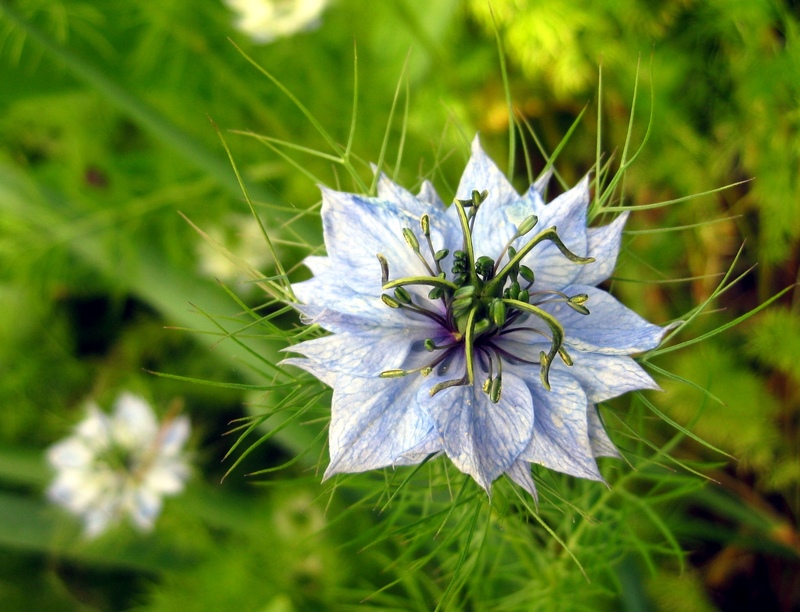 Love in a Mist easily reseeds itself which is great. I wonder if these plants are completely adapted to grow under my cedar tree because my neighbor tried to get some to grow in her yard and it didn’t work as well. At any rate, I love these reseeding annuals. I made a facebook photo album of the cats at my house. I figure if I’m becoming a crazy cat lady then why not document it? 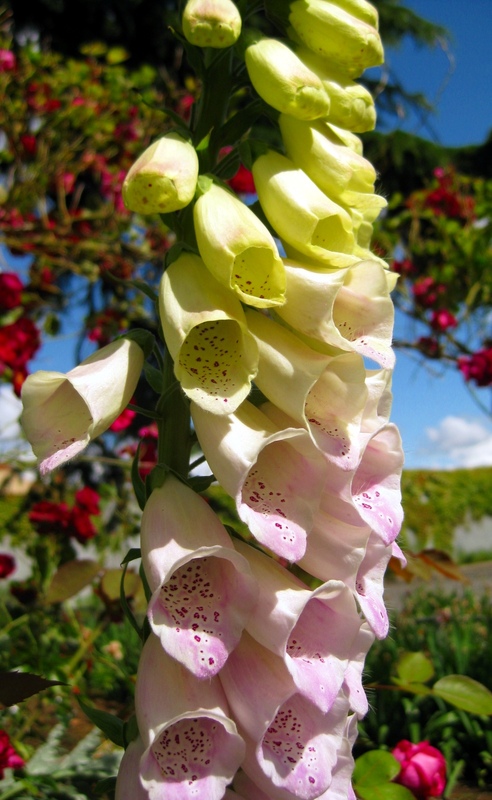 I love foxgloves! They make me really happy. A few years ago I planted some pink foxglove seeds and since then they have reseeded and filled my yard with a wide variety of colors. 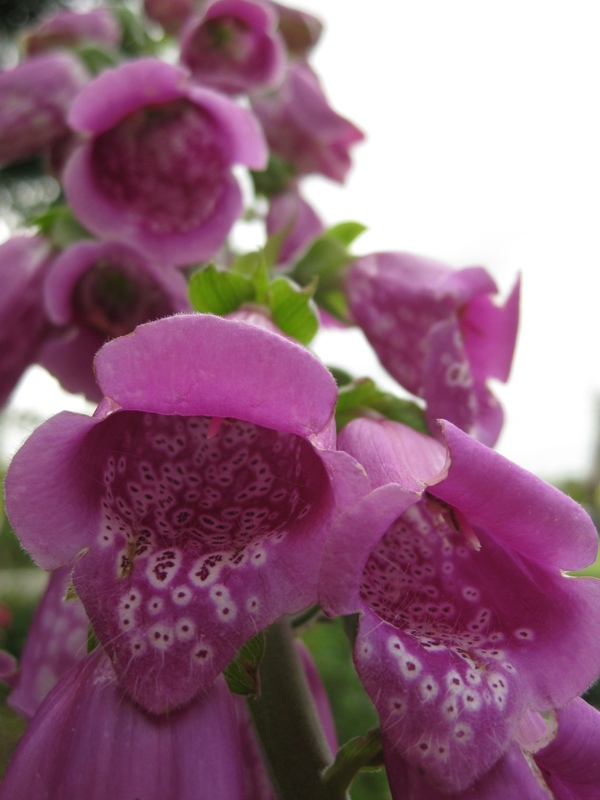 here are some current foxgloves! It might just be an all garden shots for awhile. 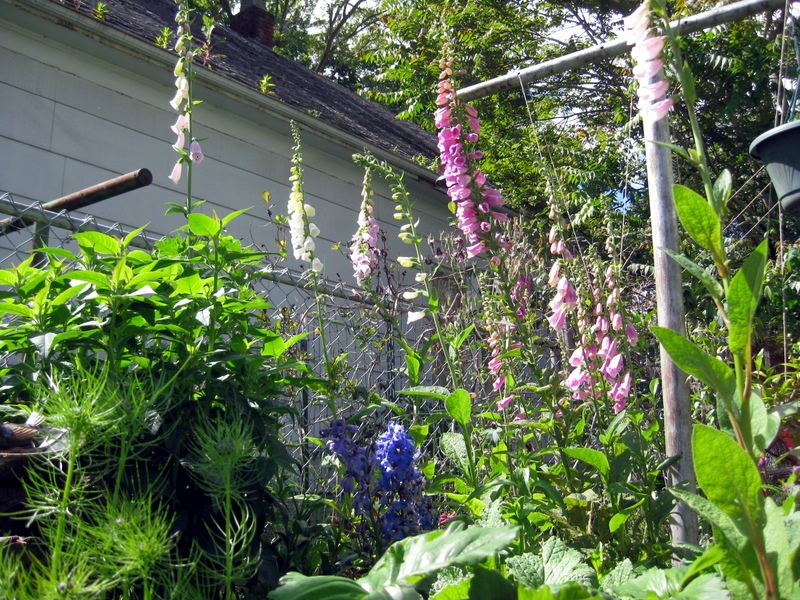 Foxgloves in the Hummingbird Garden. There's also a bit of a dephinium there too. I saw some blue sky a week or so ago! This is one of the neat foxglves that changes from pink at the bottom to yellow at the top. closer look at the color change. Ok, not all plants. OJ has taken to sleeping outside when it’s not to cold or rainy. I went out to put the mail in the post box and I found him curled up in the irises! What? I heard it was a flower BED! A weekend of dogs and some garden talk. It has been a weekend of dogs…. and the cats hating me. I have had my sister and brother-in-laws dogs since Thursday. It’s not that they are bad dogs, they are just really needy and constantly looking at me like “so, when’s mom coming back?” And as many times as I tell them they just stare at me and then go find garbage or cat poop to eat. Currently they are both sleeping in my bed while I type and will accompany me to the airport in a few hours to finally have their question answered. I wonder if all the times they have gone to the airport they just think that one or both of their people jsut stays in that airport building until they decided to come home. who knows. Yesterday my mom called me to see if I wanted to dog sit for afew hours whil she went shopping. She just got a Cavelier King Charles Spaniel that I hadn’t seen yet. He name is Maggie and she is adorable! I spent a few hours up at the Riverhouse dog sitting for 3. Mostly I just held Maggie who had two modes:I want to bit every inch of you and also sleep. I wish I had more time to spend up there but I had to get home. The two cats at my house are indoor outdoor so they have been glaring at me with the dogs. Jackie just sits on the porch and watches the dogs who don’t seem to notice him half the time .OK just freaks out and runs away. The weather has been cloudy and I have been working in my yard a bit. I planted some Morning Glories that I have grown from seed so i’ll have 3 different varieties to entice the Hummingbirds. I also planted some plants I got at a yard sale. Some were mislabeled and some weren’t labeled at all. The woman told me one was a bluebell and it clearly wasn’t. But, I put them in my yard and I have started planning what I’m going to transplant next year to make the yard a bit more colorful during the whole growing season. Paul and I are also planning to take out our chainlink fence and leave the posts in and attach a picket fence to them .We are also thinking about using the chainlink to make a chicket coop and get chickens next year. We’ll see if it works out. Right now I have to get up and start my day. Gotta pick up my sister soon and i have a zine symposium meeting tonight that I need to do some work for. 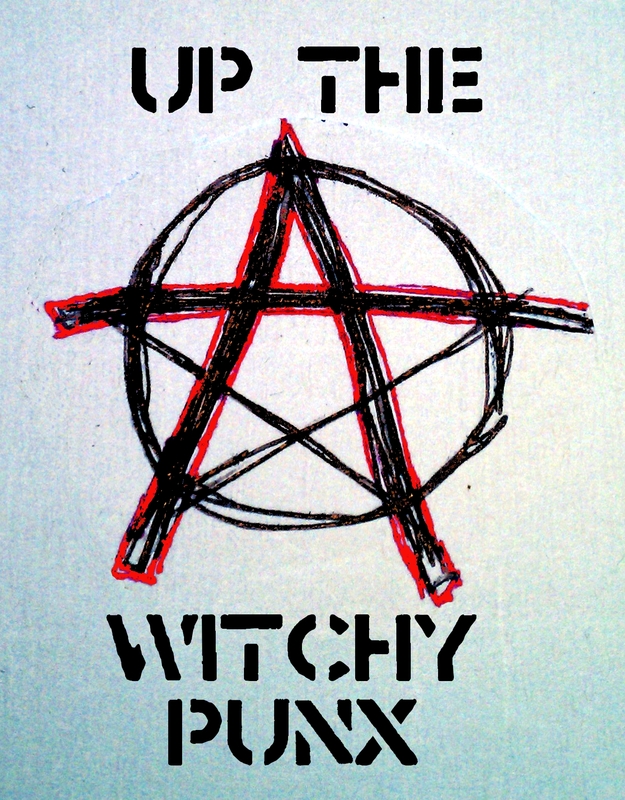 Oh, here’s a new review of Stolen Sharpie Revoluntion 2 on Book Spew. hand roasted Ethiopian Yirgacheffe, Strawberries from our yard last year and mint from this year. I let the coffee steep for 2 days, the mint for 5 and I’m going to take the strawberries out after 7. The coffee vodka smells amazing! Now I jsut need to figure out what to make with these! Paul and I went to the Farmer’s market on Wednesday and picked up some asparagus and other things. The other night I made some spinach pesto pasta and topped it off with asparagus, onions, grape tomatoes, and olives cookined in red wine. It was yummy! I have also been working in my yard… as usual. Yesterday I decided that I don’ want any grass anymore and started removing some by my front door. Paul thinks it is just an excuse for me to buy mroe plants. Maybe he is right but working in the yard keeps me sane and we all like a sane me. I bought a few more veggie starts and so far this is what is in the veggie garden: Carrots, chard, spinach, lettuce, beets, purple cabbage, celery, brussel sprouts, broccoli, about 3 different kinds of beans, 2 different tomatoes, pumpkin, zucchini, yellow squash, strawberries, eggplant, and corn. I also planted flowers in the middle of the garden because I think they will look nice so there are climbing nasturtiums crawling up some old artichoke stalks, sweetpeas and sunflowers. I think once everything starts growing well I’ll have a very pretty garden. I’ll take more photos when things take off! 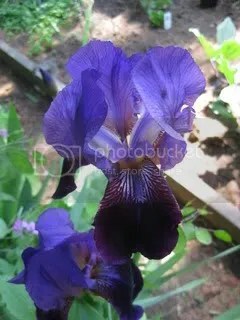 I’m excited that I came back just in time to see my irises in bloom. I’m really going to have to clean them out and trade them off in the Autumn thought because they are getting unruly again. artichoke. Paul likes to talk to it and tell it how much he will enjoy eating it. It is sort of weird and also very cute. first of many foxglove blooms! 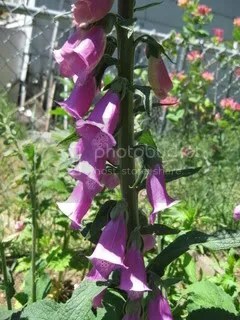 I love foxglove. 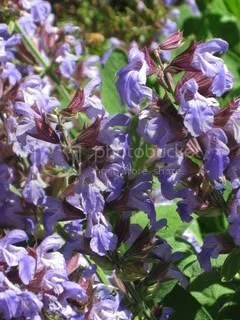 blooming sage. It has taken over the lavender plant that grows next to it. little white moss flowers. There is moss growing between chunks of concrete that is my back patio. 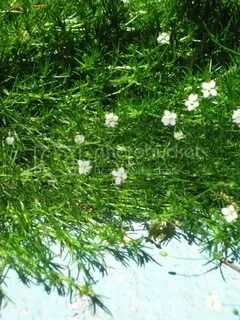 I love the tiny flowers they have. Paul and I are taking off to the riverhouse tonight after my IPRC shift. I’m really looking forward to getting away for a few days. I need it. So, I veganazied Funeral Potatoes the other night. Funeral Potatoes is a Mormon casserole that I guess they make for funerals. My friend Mox taught me out to make them but they are dairy overload lots of sour cream, cheese, milk and cream of mushroom soup. ugh. Not to mention the corn flakes on top which just sort of makes casseroles creepy. I got to portabella mushroom soup, a half tub of better than cream cheese, a red onion, some vegan mozzerella and a ton of frozen hashbrowns. I get a certain perverse pleasure in veganizing things sometimes. It didn’t taste the greatest and let’s be honest? How can you really photograph a casserole and make it look awesome? But it was edible and filling. Paul and I reorganized our records to fit into our EXPEDIT (the best record organizer ever!) Our records were getting out of hand with random stacks around the room left over from full moon nights and spontaneous DJ parties. We too the desk that the record player used to sit on upstairs so that Paul has something to put his new laptop on. Well, the desk sat in the middle of our dining room for awhile but we finally got it sorted. I like how it is now. It makes every thing seem closer to the ground. We also hooked Paul’s old computer up to a monitor so we have a computer that we can play the rest of the itunes network on. That’s pretty fun. Today I went over to spend some time with my sister. I stopped by the Flavour Spot and got two veggie sausage and maple waffels. We did some catching up, I helped her in her garden and then we sawed off her handlebars. Good times! At one point she said “hey, will you twitter that we are playing bike mechanic just like we used to 20 years ago?” And it’s true! We totally used to play bike mechanic! Then we went and got burritos! I’m still recovering from burrito coma. I replanted some of my seeds that I think didn’t make it through the massive rains we had while I was in Seattle a few weeks ago. I’m also compiling a mental list of things I can have my sister do in my yard tomorrow when she comes over. There is lots of weeding and planting nasturtiums in my porch planter boxes. Also, one of our longest housemates is moving onto more scholarly pursuits and housing so we are going to have an open room in our house come May. maybe you know somebody who is interested? Paul has just figured out how Rugby works and is watching some match on his computer. He’s strangely fascinated by it. I’m going to go and see what the deal is. I slacked on my work yesterday after coming back from the post office but I have and good reason… False Spring! The sun was out and the weather was in the mid 50’s. The irises are starting to shoot up as well as the bulbs. I trimmed up some bushes, transplanted some plants, put some plants in pots to give away, pulled weeds, and even read a zine while sitting in the sun with Marc’s cats, OJ and Jackie. I also smashed a finger, that wasn’t fun. Toward the end of my day someone came to pick up some custom buttons while my hands were inches deep in the roots of a violet plant. The buttons were for somoeone in a beer competition…. and the person who picked the buttons up bround me a half gallon jug of beer! What a perefect payment and a great way to end my work day! I think the beer was an amber and it was really drinkably smooth with a nice malt base and very balanced. Then Paul and I made a vegan mushroom alfredo sauce with penne while listening to records starting with Jane’s Addiciton- Nothing’s Shocking. The alfredo sauce is really rich and I made with a coconut milk base. I hadn’t made it for awhile so I’m glad I remembered the recipe. Paul made the garlic bread my favorite way: margarine, Vegenaise, fresh chopped garlic and parsley. Seriously, Vegenaise makes everything yummy! The beer went really well with the meal too. Then we worked on our crosswords puzzles while continuing our late 80’s early 90’s alterna-rock with Jesus and Mary Chain, Love & Rockets and Nine Inch Nails-Pretty hate Machine. ha! What I really wanted to write about was karaoke. Last night I went to the Alibi with Marc and LillyMonster. I needed to get out of the house and they invited me. Let me make something perfectly clear, I don’t sing karaoke, ever. end of story. See, I have this thing. I will never do karaoke. I know it is all fun and no one cares blah blah blah. But here’s the deal: I have sang in real bands and when you are in a band everyone has a chance of messing up. When you are singing karaoke the one messing up is you. I can’t wrap my brain around that to make it alright. Last night I got made fun of for scouring through the song book by band in alphabetical order. Most of the bands and singers I had never heard of and definitely none that I would want to sing to a room of drunk strangers. Sure, I have a soft spot in my heart for a few things like Meatloaf (yes, Meatloaf) ABBA and Willie Nelson but I jsut couldn’t see myself singing any songs by them in front of people. It made me realize some things. One, I’m sort of a snob. and two, I have spent many years living in a pop culture vacuum. I stopped listening to FM music radio in 1992 so I don’t know any of the popular songs and even when I did listen to the top-40 radio it was the “modern rock” or “college rock” station. As I put it to them last night I was already too-cool-for-skool by jr. high in the late 80’s and made fun of people who listened to the New Kids on The Block, and Milly Vanilli. I don’t have those strings of nostalgia attached to them that would make me want to share it with others. The songs that I have those connections to aren’t going to be in that book. I won’t find The Cure-Jumping Someone Ele’s train, Joy Division-Transmisison, Bad Religion-You, Tilt- Suspended, Dead Milkment-born to Love Vocanoes, or Discount-Fixing Rubble Building Us. Those songs just aren’t going to be there. Because of that I guess I just don’t see the point. I’d rather be good at making zines and solving crossword puzzles. I’ll leave the singing up to people who enjoy it like Paul… except for the one time he coaxed me into singing back up vocals on the very last song here… cause there’s a lot in life you can’t explain. Ok, off to go polish my workshop notes or the Etsy Workshop I’m teaching at the IPRC tonight. False Spring… happens every year. It seems like every February in Portland there is a false spring. A week or two of beautiful sunny weather that tricks everyone into wearing shorts and riding bikes in smiling packs. For me it lures me out into my yard with planning and planting in mind..
Last year I planted a bunch of seeds but our housemate at the time had a cat that got into our room and decided to eat all the seedlings! 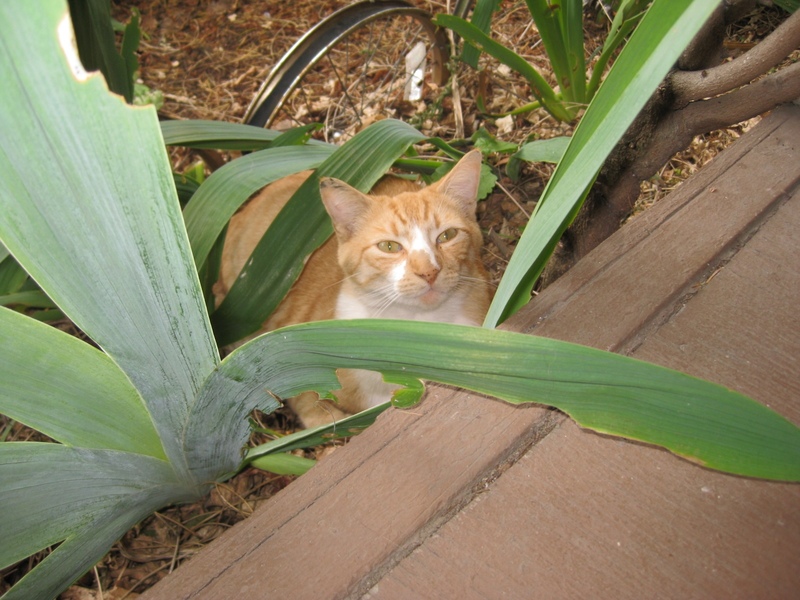 What kind of cat eats plants? I also had a damping off problem since it was really humid last year. This year I planted over 40 different seeds on Imbloc (feb 2) Some of the seeds are old and about 30of them have come up so far, I think that’s pretty good. I’m going to be gone a lot this spring so I wanted to get started early. Last year I realized that I had never documented the seasons of my yard so I started. I have photos from April 2008, beginning of May, Mid May, and June. Well, after that the year went down hill and I got busy so I wasn’t able to take more pictures. I was able to get my winterizing done though so there isn’t much left to do this spring. Well, our false spring was last week and I got Paul to scour the neighborhood with me for fallen birch branches. I have been building little fences around all of my flower beds. I think they look really nice. 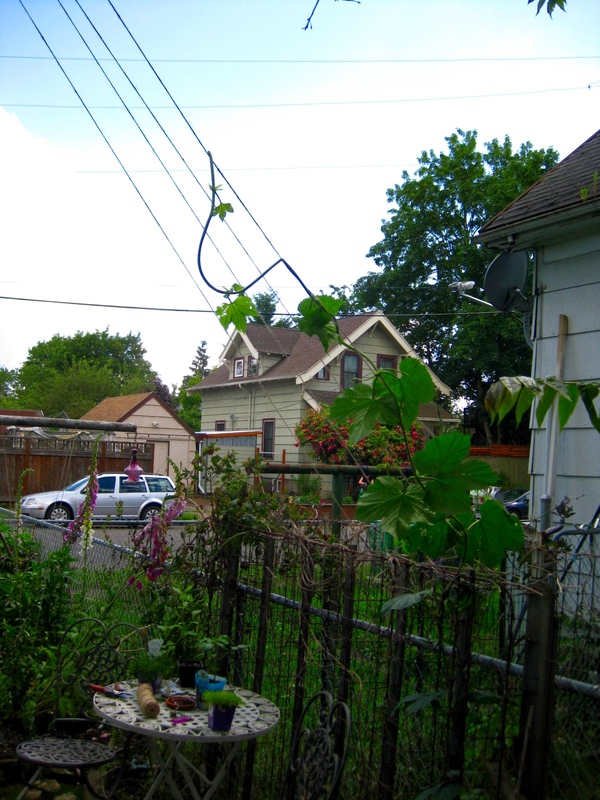 Today I spend about 2-3 hours working in my yard… most of it was spent trying to tie up the unruly Wisteria vines. I let then grow our last year because I read that they will have more blooms of you do. 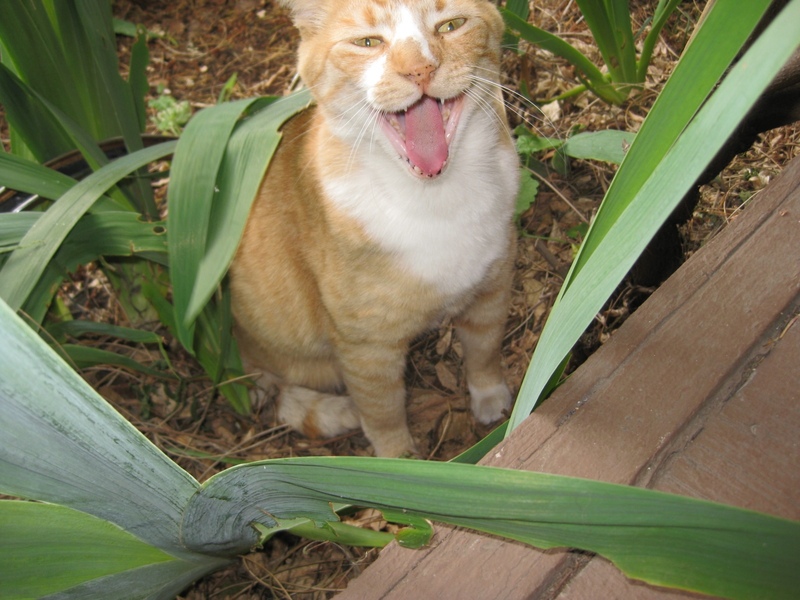 Anyway, here’s an image that pretty much sums up my yard work and garden in February of 2009.